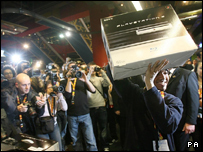 The PlayStation 3 console has broken UK sales records with more than 165,000 machines sold in the first two days of release, say analysts Chart Track. More than a million consoles were shipped across Europe on launch day last week with 600,000 sold. Sony is hoping to retake its title as the console market leader, as Microsoft and Nintendo head the next-gen race. Meanwhile, games firm Namco Bandai has said it is to use the PS3's Cell chip in arcade machines. Microsoft sold 71,000 Xbox 360 consoles during its UK launch weekend, while Nintendo sold 105,000 Wii machines. But both companies offered limited stock to retailers, which led to shortages. Ray Maguire, managing director of Sony Computer Entertainment UK said the figures were a vote of confidence in the machine. The first arcade title to use the PS3 microprocessor will be fighting game Tekken 6, Namco said. While PlayStation technology has been used in arcade machines in the past it is believed to be the first time that the Cell will be used for games not running on Sony's console. Namco Bandai has sold its PlayStation 2 arcade technology to other firms, but it is still undecided about whether to sell its PS3 Cell-based technology, a spokeswoman for the firm said. All you need to know about the PlayStation 3 hardware. Are you waiting for a PS3?